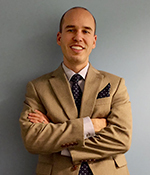 Evan has practiced law since 2008 and is licensed to practice in California, Connecticut and Louisiana. His entire practice has been devoted to litigation. After graduation, New Orleans erupted with Hurricane Katrina litigation. Evan worked for a new Orleans firm defending Hurricane Katrina lawsuits brought by homeowners and business owners. A number of these lawsuits were litigated at the appellate level. He also achieved a defense verdict in a slip and fall trial. In 2010, he and his wife moved to New Haven, Connecticut for her medical residency at Yale University. During the next few years, he worked for Travelers Insurance Company defending numerous personal injury lawsuits and delivering over 50 oral arguments in court. In 2014, he moved to San Diego so his wife could complete a medical fellowship at UCSD. He then opened his own firm to represent people after years of defending companies.